What's a BlackBerry user worth? Last week BlackBerry announced that it had 72 million subscriber accounts. The current market capitalization is $5.4 billion and enterprise value (i.e. excluding net cash) is about $2.8 billion. That implies a net present value of about $40 for each account. 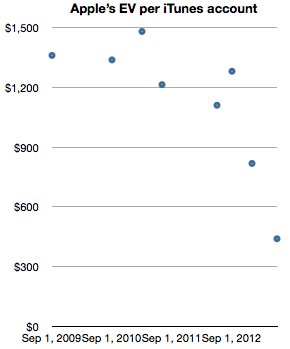 This is quite a drop from early 2010 when the value was $866. I’ve also added a graph showing a derived value of US consumer BlackBerry users (derived from comScore’s survey data). Second, that the collapse in value per user occurred in advance to the peak in users. 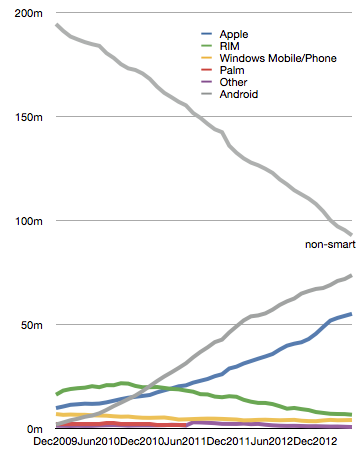 This is, of course, linked to other user base leading indicators such as device sales momentum. But the drop indicates that there was no perceived value in the BlackBerry install base to begin with. As devices went, so did the company. 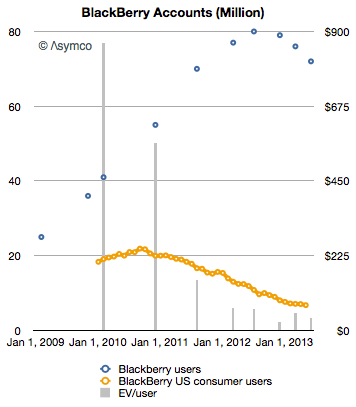 In the case of RIM/BlackBerry, the drop in value per user accurately foretold the drop in user base. Does the drop in value per user for Apple foretell a reduction in users? So far, iOS user base (as proxied by iTunes accounts) continues to expand, even in the US.